Following the trend of unveiling new machines for IAPPA, Sega have announced their new arcade machine, ATC Slam. Taking place in Orlando, Florida from November 13-16, IAPPA will be customers' first chance to experience the new machine. ATV Slam features a life sized quad bike offering 10 different exotic environments to race in. The game features a unique artificial intelligence system and 47 inch screen which creates an extremely realistic racing environment. 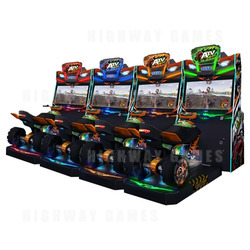 The game also includes a chrome engine compartment, an accelerator on the quad bike's handles to create realistic game play, 3 game modes and 15 different bikes to unlock. Each vehicle has different power and design. Players will race to the finish line avoiding obstacles, drifting and performing stunts for extra points. You can check out the game at the Sega Amusement booth (booth number 1506 and 1606) at IAPPA. Tickets are still available for the event and can be purchased here.